Eastern Michigan coach John Goodridge talks to (left to right) “Ice” Andresson, Willy Fink, Nick Raymond, and Warren Witchell. Ann Arbor is one of America’s great college towns. Home to the University of Michigan, a so-called “public Ivy”, the walkable and friendly downtown has something to offer nearly everyone. Intellectuals, hipsters, foodies, and enthusiasts of art or music or movies all find their needs met. And most of all, it’s home to some of the biggest of big-time college sports. Wolverine fans pack Crisler Arena for basketball and Yost Ice Arena for hockey, and 100,000 strong fill The Big House for every home football game. At the other end of Washtenaw Avenue sits Ypsilanti, a decidedly less glamorous college town. Eastern Michigan University is here, a campus of 23,000 students and a member of the Mid-American Conference. The contrast between the towns and campuses is stark. The UM community rather arrogantly refer to themselves as “the leaders and the best”, but they back it up. Michigan alumni include a president, astronauts, 21 billionaires, eight Nobel laureates, and three Heisman trophy winners. In contrast, EMU and dozens and dozens of other so-called “directional schools” produce fewer of the rich-and-famous, and most of their graduates are simply the millions of people who make the nation run: teachers, nurses, office drones, small business owners. The “mid-major” universities produce America’s vast professional middle class. EMU football might be called a “mid-major” but it doesn’t even rise to that level. The Eagles have been to two bowl games in all of school history and has but a single MAC title since joining the conference in 1965. The basketball program has a bit more success, with four NCAA tournament appearances, but not much more. There is one sport in which Eastern has been among the elite of the nation’s mid-major programs, and that’s men’s track and field and cross country. The Eagles have fifteen NCAA titles to their credit, three NCAA top four “podium” team finishes, and two Olympic gold medals. In the years just prior to joining Division I, they won nine D-II and NAIA national championships. It’s probably the only sport on campus in which beating Michigan wouldn’t be an upset of immense proportions. The Eagles don’t need to beat the Wolverines this Friday in order to qualify to the NCAA cross country championships, but they do need to beat one or more of the other ranked teams in the Big Ten. I went to Eastern Michigan to meet the team because I think they might be able to do it. There aren’t many people outside of Ypsilanti who agree with me. On the first day I showed up to campus I met the team at Bowen Field House, the track team’s home for much of the year. Unlike most college’s indoor tracks, this one has been around for a while. The cinder block building opened in 1955 to house the track and basketball programs, and then track took over when the basketball team moved to a new arena in the 90s. Spectator amenities are sparse here, but the track setup is pretty nice. The team’s assignment was a long-distance run of an aerobic/recovery nature. Ypsilanti doesn’t look all that hospitable to running but a few quick turns off of campus and the men were running down an unpaved country road. It was the normally cold, drizzly, grey day that the lower Great Lakes area tends to get in late fall and their shoes and backs were quickly caked in mud. The scenery was nice: rolling hills, red barns, bare trees and brown fields full of corn stubble and leaves. Their coach, John Goodridge, is a fit and soft-spoken man of some indeterminate late middle-age and this is not his first rodeo. He’s been at Eastern since the legendary Bob Parks retired in 2001 and he led the 2003 cross country team to an NCAA third-place finish. Before that he took Wake Forest to their lone NCAA podium finish (third, in 1989) and previously he coached the women at Michigan State. When he says he thinks his team has a shot, he’s speaking from experience. The team had a decent but unimpressive regular season. They took 17th at the Notre Dame Invitational and 12th at the Pre-Nationals. That gave them just one win over a likely qualifier (North Carolina State) and if they make it to Terre Haute it will be on a “push” (where a team with insufficient points for at-large selection to the NCAAs gets in by virtue of beating a team in their region that does). As of right now, the predictions are that anywhere from two to four men’s teams will qualify from the Great Lakes regional, and Eastern is ranked fifth in their region. It’s always hard to predict what will happen, though. The leader of the group is Willy Fink, a junior from Toledo, Ohio. He was a good runner in high school, a 4:14 miler and third at the Ohio Division I cross country championships, but his improvement curve was such that a big step up in college looked unlikely. Nothing could have been more wrong; he went from 21st in the MAC as a freshman to 11th as a sophomore and champion this year. But in retrospect, you might have expected that from a kid who came out of a notoriously blue-collar city and background: his father was a high school industrial tech teacher and his mother a postal worker, so it’s more or less ingrained in Fink that work equals results, even if those results don’t come right away. Two international students, both redshirt freshmen, were the team’s #2 and #3 runners throughout the season, Belgian Lahsene Bouchikhi and Icelander Hylnur Andresson. Bouchiki might be a familiar name—his older brother Soufiane was a star at Eastern Kentucky—and Lahsene was the team’s #2 man at all of their major meets, finishing right on the heels of Fink at the MAC Championships. He’s still learning about US-style cross country team racing since his entire running experience up until now has been in the European club system, where the emphasis is entirely on the individual. Hylnur Andresson (known simply as “Ice”, since propertly pronouncing “Hylnur” is about impossible) is not a name that is familiar to anyone who follows running on any level. The tale of how he ended up at EMU for only his second year of organized competitive running is truly bizarre. A basketball player in Iceland, he initially came to the US as a high school exchange student in Maryland, joined the school’s cross country team, and qualified to the Maryland state meet. He decided to attend tiny Alderson Broaddus, a Division II university in West Virginia, and continued his running but soon figured out that he was too competitive a personality for what “A-B” offered him. (“This is a very..serious..young man,” said Goodridge, with pauses for effect.) Two of his new running buddies were Fink’s old high school teammates and they suggested EMU to Andresson. So he transferred to Eastern, spent a summer training and racing with a track club in Iceland, and came to campus in August in fine shape–and completely under the radar and totally new to this kind of racing. Bouchikhi and Andresson are improving fast as the season goes along, and that’s one reason why I expect the Eagles to run better than their fifth-place ranking in the Great Lakes region. The other reason is that they were missing key runners in both of their major invitationals. The most decorated runner on the team coming out of high school was Nick Raymond, a Foot Locker finalist from nearby Erie, Michigan (just across the state line from Toledo). But he’s been held back by recurring injury problems over his first two years, and his first appearance with the ‘A’ team this fall was at the MAC Championships where he finished seventh. Earlier in the year he’d won a low-key 5k race and two weeks later finished just five seconds behind Fink at Michigan State’s Spartan Invitational, but he was unavailable for the major tests at Notre Dame and Pre-Nationals. If he can stay healthy and run anywhere near his potential, then the Eagles are a much different team. The lone senior among the team’s key runners is Warren Witchell, from Williamston, Michigan (near Lansing). Of all the runners on this team, he’s the one who appears to have become a competitive college athlete on sheer willpower. His best 3200 meter time in high school was just 9:58, and he turned that into college times of 14:20 and 30:30. A hip problem slowed him during the last indoor and outdoor seasons, and then a raft of summertime responsibilities cut into training time. He came to campus well below his abilities, and Goodridge ran him in the JV race at Notre Dame. He responded with a tenth-place finish in that race and has made steady progress since then, topped off with an eighth place at the MAC meet. At that MAC Championship meet, Fink came out a winner as expected, but with Bouchikhi just five seconds back in second. Andresson, Raymond and Witchell closed the scoring before Akron (the pre-meet favorite according to Flotrack) got their second man in. The Eagles posted a meet-record score of 23 points and a 1-to-5 gap of just 20 seconds. A performance like that at the regionals might or might not be enough to get them to the NCAAs, but it’s quite reasonable to expect them to take another step up this Friday. The two freshmen from Europe are still learning about US-style team cross country racing, and Raymond and Witchell are still steadily improving their condition. I’ve often said that to live in the heart of the industrial midwest, the so-called “Rust Belt”, is to experience a constant feeling of loss. The once-powerful city of Detroit is now the object of derision or pity or both, and on a smaller scale it’s more or less the same story in Toledo, Cleveland, Buffalo, and dozens of smaller cities throughout the area. The Mid-American Conference reflects all of that. The conference was once a powerhouse in cross country but is no longer. My alma mater, Bowling Green, once finished in the NCAA’s top ten for four straight years but killed off the men’s track programs in 2001, and the cross country program is a shell of its former self. The same goes for Ohio University, for whom Mo Banton won the 1964 NCAA cross country title. Toledo no longer has a men’s track team, and there are no men’s running programs of any kind at Ball State or Northern Illinois. Of all of these, the worst offense is at Western Michigan. Fifty years ago this fall, the Western Michigan Broncos shook up the running world by defeating the favored Oregon Ducks for the NCAA cross country championship, and then following it up with another win the next year. Bob Parks was an assistant coach for those teams, and soon after he went back to Eastern Michigan (where he had been a quarter-miler) to take the head track and cross country jobs and turn his alma mater into a mid-major juggernaught. Western’s past successes meant nothing to administrators, though. On 10:00pm on December 3, 2003, the athletes and coaches in men’s cross country and track and field (plus one other sport) were told that their programs would be eliminated at the end of the academic year. To this day, the MAC has won just three NCAA Championships, and those WMU cross country victories make up two of them. EMU team captain Willy Fink knows a thing or two about cut programs. In April of his sophomore year at Toledo’s Bowsher High School, the Toledo Public Schools announced that boys’ and girls’ cross country (plus four other sports) would be eliminated from the district’s athletic programs. I coached across town at Start High School and we figured out a way to make our way in the wilderness, but Willy needed serious competition if he was going to meet his goal of running in college. So he and his mother pulled up stakes and moved into an apartment in the neighboring suburb of Maumee, leaving the rest of their familty behind in Toledo, so that Willy could continue to run. That was the turning point for Fink, both as an athlete and as a student. Thrown into a completely new school environment, at first he didn’t have much to do with his time but run and hit the books. Once he settled in, he still knew that his family had made major sacrifices in order to allow him to pursue his dreams. From there on out he took both running and school very seriously, and he progressed from a locally good athlete to one who attracted attention from college coaches. Consistent work over several more years has taken him to yet another level. On the second day I came to campus, the team was doing their last quality work to prepare for Friday’s regional championships. 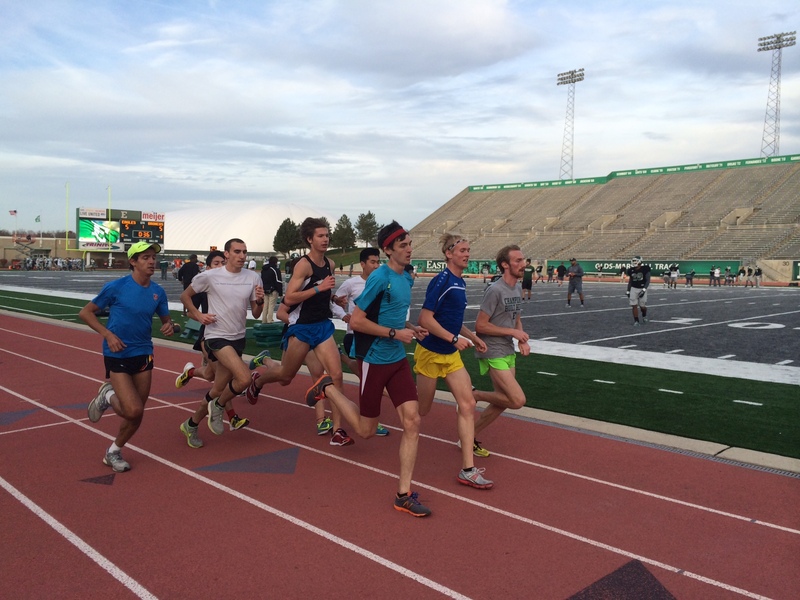 After warming up, they went to the track in Rynearson Stadium and did 3200 meters at 10:00 on the nose, followed by two 400s in about 62 seconds each. Eastern Michigan’s football team held their practice in the stadium at the same time, and the two teams stayed out of each others’ way. The team is remarkably calm and even-tempered, even by the standards of distance runners. They expressed no nerves about the upcoming regional meet. They have no detailed race plans, preferring to react to things as they happen. They don’t specifically attempt to run as a pack unless the opportunity presents itself. They had no worries about the bitter cold forecasted for Friday’s meet, figuring that everyone else will have to run in it too. (Then again, the varsity seven come from Iceland, Belgium, and US lattitudes ranging from Toledo, Ohio to River Falls, Wisconsin, all places where difficult winters are the norm.) They had the appearance of a group who sees the meet as a chance to do something unexpected, “an opportunity to add to the Eastern Michigan tradition”, as Goodridge said. College football only works on this grand scale, I believe, because it’s about the colleges. The alumni connect to it. The people in the town connect to it. The people in the state connect to it. People are proud of their connection to the University of South Carolina and Clemson, they are inspired by Alabama and Auburn, Penn State and Notre Dame and Stanford, they identify themselves through Missouri and Wisconsin and Florida and Texas A&M. The players matter because they chose those schools, they play for those schools, they win for those schools and they lose for those schools too. Everyone, of course, wants them to be the best players available, and some are willing to cheat the current system to get those players. But soon the players move on, and the love affair continues, just as strong, just as vital. The CONNECTION is what drives college football. Does college cross country have those same traditions that bind us to the past? At Eastern Michigan, it doubtlessly does. 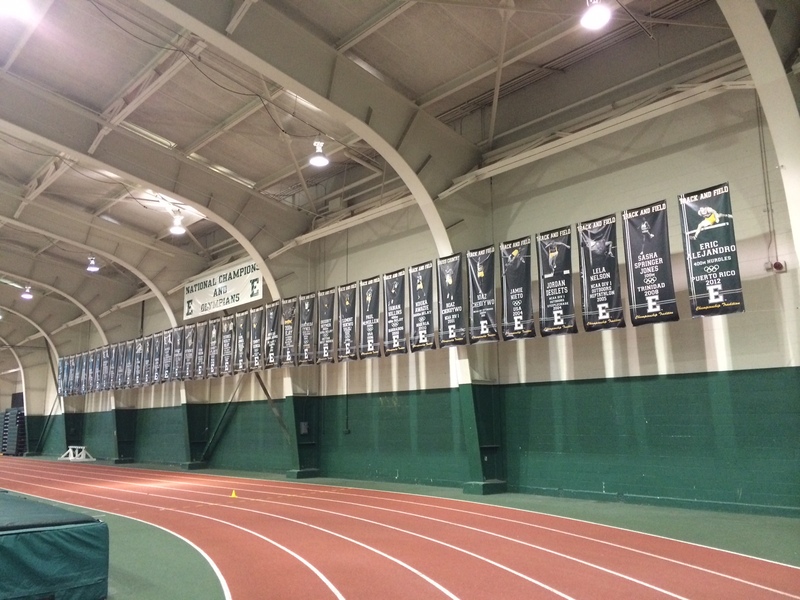 You can’t walk into Bowen Field House without nearly being hit in the face with reminders of EMU’s fourteen Olympians and countless conference champions, and Rynearson Stadium lists the twenty-two MAC champion teams in outdoor track & field. The recent MAC Championships at Central Michigan brought out alumni and supporters with flags and cheers and a sea of green and white. Goodridge preaches that tradition, in no small part because he thinks it’s fun to be part of a tradition of success and because fun is in turn an integral part of sport. He asks them to “embrace and respect the history of those they are following” and to realize that when they add to that history then they become part of it. Goodridge said because the team was so new and so young, back in September they lacked any team identity, but they have developed one over the intervening months. In those final two 400s of the workout I can see how the parts play together as a whole: the bearded Fink calmly leading the group even if not always in front, Bouchikhi looking the European part in his club t-shirt and yellow hat, Andresson running as much like a bull in a china shop as a 6’2″/150-pound runner can, Raymond running smooth as silk, and the short-and-muscular Witchell appearing as a hobbit keeping up elves. On Friday afternoon in Madison, Wisconsin, at 2:00pm (Eastern time), it’s go time. Thanks for the story. I live in Ann Arbor (‘A2’) and keep an eye on UM’s team but hadn’t fully paid attention to to EMU’s. Sad to read about so many colleges dropping CC and track to support big time football. I ran at UMass back in the 1960s and they buried our outdoor track with a building (we ran intervals on a road with spray markers at the 1/4 miles) and then big time basketball took over our indoor track. All our meets were road meets. I gave up and ran road races. John, I really enjoyed this article. I often tell that incredible tale from Wake’s Camp session where you had two guys break 4 for their first time ever for the campers . Heck, if you can pull off that feat, you can make magic happen tomorrow ! Great article about a GREAT program! GO HURONS, I mean EAGLES! Being an 1967 EMU Alumni and a devout supporter, this article brought chills up and down my spine because it brought out the true green tradition of the EMU XC/T&F Family. Our/their work ethics is unrivaled with any other school in the state/nation. I LOVE our EMU TRADITION. The WOMEN’S/MEN’S Coaches are top notch because of their knowledge, dedication, passion, and sacrifice. 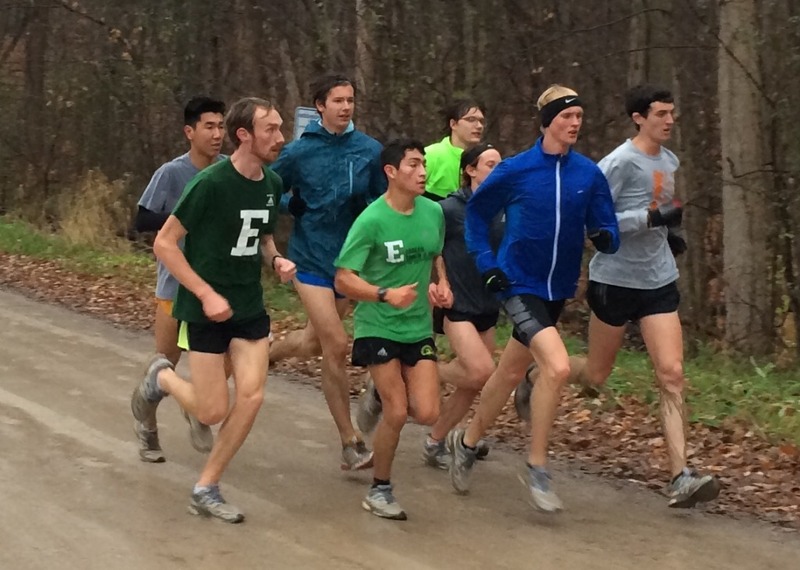 The EMU XC Teams are by product of the coaches. Their energy level is off the charts. NEVER SAY NEVER YOU CAN DO IT!!! This is a great piece of writing. Ice has many fans back in Western Maryland. So glad to see him part of a thriving program. Great article. EMU has a rich history in not only Michigan, but in the US. I remember running indoors at Bowen and one never knew who would show up to run. From big time sprinters to legendary road racers trying to get in a good indoor race. Goodridge is a great coach with a good group of runners this year….They’ll make it! That was a great article. I ran at ND in the 70s and saw the great Gordon Minty up close many times.